The next several posts will be covering the education of deaf children. Remember the purpose of these blogposts are to help families understand the many unique challenges they will face if they proceed with the adoption of a deaf child. I have asked families who have up-close-and-personal experience to share them with you. Parental involvement and attitude is paramount in the education of the deaf child. This topic will be one that will be open ended, as the research for educating deaf children is ongoing. There are many differing opinions as to what is “best” for educating a deaf child. Each deaf child is unique in ways that will impact their learning. Especially when adding institutionalized care to the equation. In addition, these differing opinions have impacted the classrooms of deaf children at the deaf school, as well as, in the public school arena. Families adopting deaf children need to be aware the education of your deaf child(ren) will be challenging and frustrating in many ways, no matter the choice you might make, the deaf school, the public school setting or via homeschooling or a combination of any or all. You must also realize it is possible the brain of a deaf child that has been deprived of learning language from birth could have great impact on optimum learning capabilities. Add to that the trauma the brain has experienced from neglect and lack of nurture during those early years. Having a realistic understanding of the possible educational challenges facing a deaf child with no language from birth and a trauma-brain is vitally important for those families desiring to adopt them. I am not saying all adopted deaf children will be limited in their learning capabilities or they will be low-functioning. I am saying parents must be realistic and understand what possible challenges they could face when adopting a deaf child, especially educational-wise. 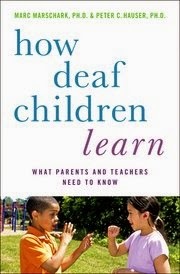 Do not expect your local educators to know how to appropriately deal with and educate the adopted deaf child, either. If you are not willing to become a full-time advocate for your deaf child’s education, be it in a formal setting or in your home, you must genuinely reconsider deaf adoption. You will also teach your deaf child how to self-advocate for their future. In addition, you will not know what really goes on in a school or a classroom until you have observed it with your own eyes and on multiple occasions. DO NOT ASSUME just because something bears a name or title, ASL, Bi-lingual/Bi-cultural, etc., it truly represents that name or title. Check it out for yourself! Often what is promoted or advertised is NOT what is actually taking place. When Marc Marschark’s book “How Deaf Children Learn: What Parents and Teachers Need to Know” was published late in 2011, I breathed a sigh of relief to see much of what my research had uncovered through the years was now shared under one title. This is a “must read”!